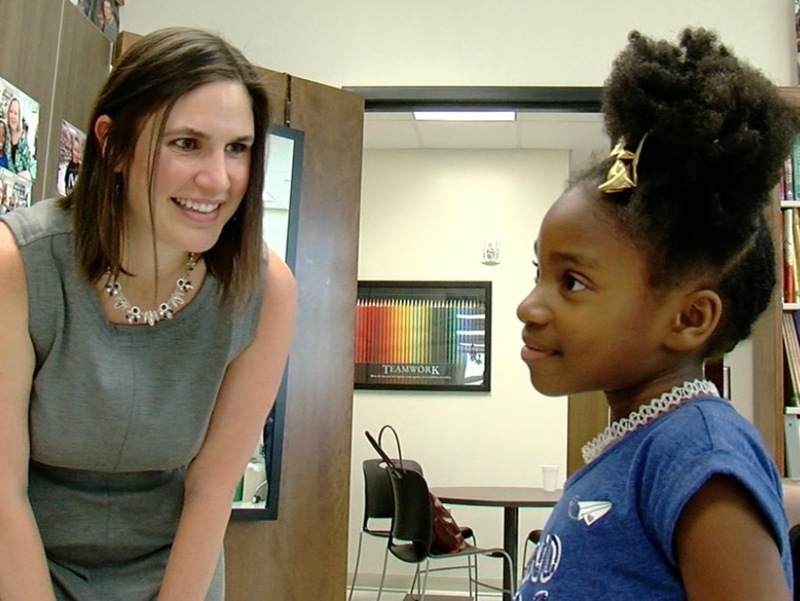 CINCINNATI — Oyler School fourth grader Mia Lee couldn’t help but smile when she saw Katarina Gay for the first time this school year. Mia and her mentor picked out a book, sat side by side and began reading together like old friends at Oyler’s Al Hampton Mentoring Center. It’s the kind of attention that could benefit many more low-income children throughout Greater Cincinnati. That’s why a local nonprofit is working to recruit 5,000 new volunteers over the next five years. It’s part of a nationwide program called Generation to Generation, or Gen2Gen, which aims to mobilize one million adults to help children thrive. The work is important for both the kids who get help and the adults who help them, said Craig Young, the executive director of Inspiring Service, which is implementing Gen2Gen here. Katie Fiorelli is the program lead for Gen2Gen Cincinnati. She taught in public schools in Chicago and Washington, D.C., before running a literacy intervention program in Cincinnati. Living here has made her passionate about the need to get more adults involved in volunteer work that helps children, she said. “I know that in the Cincinnati region there are 100,000 children that are experiencing poverty, and there are so many people in our community that want to help,” she said. Inspiring Service created an online search engine that makes it easy for people to find the volunteering activities that most interest them. The types of service include education, fitness and social skills, among others, and programs are available to help children ranging from babies and toddlers to teens and young people in college. Oyler’s Al Hampton Mentoring Program is one of those nonprofits, and the school is always looking for more mentors to work with as many of their students as possible, Kemen said. The program works primarily with students in first through fourth grades, she said, although a few older students at Oyler continue to work with mentors, too. More than 100 students are part of the program, she said. 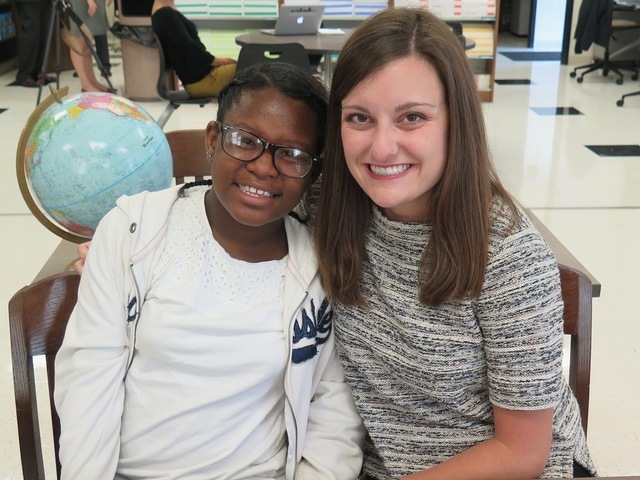 “I feel so lucky every day to watch the students be that happy,” Kemen said. Cincinnati is one of seven communities involved in Gen2Gen and is the only one that isn’t on either the east or west coast, said Douglas Bolton, chief community relations officer at Inspiring Service. Inspiring Service brought its user-friendly technology to the project and has made it much easier for adults interested in volunteering to find the programs and projects they are passionate about. “We’re finding ourselves in a relative leadership position, especially around technology,” said Young, who founded two successful software companies that he sold before starting Inspiring Service a little more than a year ago. Before becoming part of the Gen2Gen network, Inspiring Service developed a registry of nonprofits called Cincinnati Cares that has made it easier for people to find volunteer opportunities locally. Cincinnati Mayor John Cranley turned to Inspiring Service for his 2018 effort to get more Cincinnati residents volunteering, and the nonprofit already had surpassed Cranley’s goal of 100,000 hours of new service in 2018 in August, Bolton said. Nationally, Gen2Gen is aimed at adults who are 50 and older because they tend to have more time for volunteer work. But Young said age is not a limitation for the program. “A 27-year-old can help a 10-year-old very effectively,” he said. The key is for Gen2Gen to be there with information whenever a local adult is inspired to learn more about volunteering opportunities, Fiorelli said. More information about Inspiring Service and Gen2Gen Cincinnati is available online. Lucy May writes about the people, places and issues that define our region – to celebrate what makes the Tri-State great and shine a spotlight on issues we need to address. Childhood poverty is an important focus for her and for WCPO. To read more stories about childhood poverty, go to www.wcpo.com/poverty. To read more stories by Lucy, go to www.wcpo.com/may. To reach her, email [email protected]. Follow her on Twitter @LucyMayCincy.